Jeera rice is a very common rice varity cooked all over the India. This type is very easy easy to make. This is nothing but cumin flavored rice. This rice can be served with veg or non-veg curries. You can make either the everything in one pot or you can make the rice first and then toss with whole cumin & other spices. Let's check for the recipe. Jeera rice is a very common rice varity cooked all over the India. This type is very easy easy to make. This is nothing but cumin flavored rice. 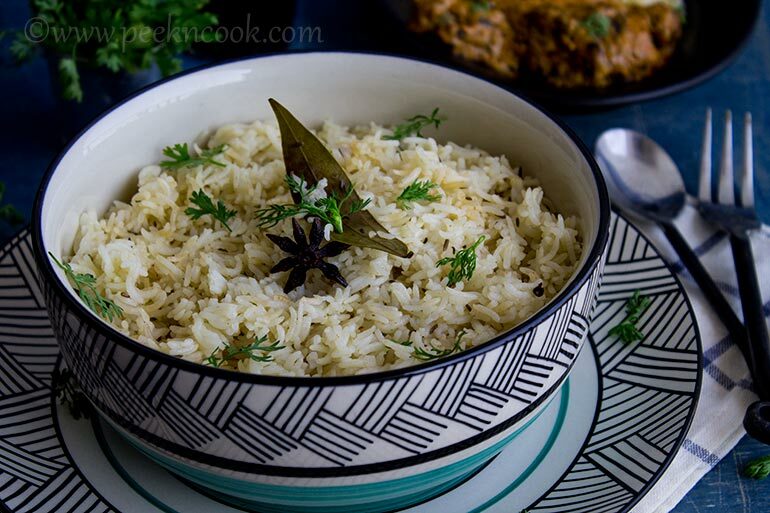 This rice can be served with veg or non-veg curries.Look at peekncook for step by step recipes - a mildly spiced and flavorful indian rice dish flavored with cumin. In the mean time take a kadai, heat oil & ghee, temper the oil & ghee with cinnamon, clove, cardamom, bay leaf & whole red chili, fry till fragrance comes. Then add cumin seeds and washed rice. Give a gentle stir, add salt & cumin powder and 2 cups of water. Cover the kadai with a lid and let the rice cook on medium heat for 15 minutes. After 15 minutes open the lid, and give a gentle stir very carefully. Cooked basmati rice is very delicate to handle while it's hot. Serve with any kind of curries. If you want to make the basmati rice seperately, then cook the rice in a handi with some salt and oil. Strain and keep aside for 1 hour. Let the rice cool down, otherwise stirring in spices wil be hard to do. When it's completely cool down, take a kadai, heat oil & ghee in it. Temper the oil & ghee with cinnamon, clove, cardamom, bay leaf & whole red chili, fry till fragrance comes. Then add cumin seeds, the cooked rice & some salt to taste. Stir everything gently and serve hot with curries. Serve this rice hot with any kind of curries. Goes best with makhni gravy. If you want to add some green peas, then fry after tempering the oil with rice.